Normal life is full of misunderstandings, add a foreign language to the mix and the possibilities for misunderstandings increases exponentially. That became awkwardly obvious when my husband called me by a nickname and one of my daughter’s friends asked what the word meant. Well, actually the word was Polish and technically it means “crazy old hen”. We were quick to explain that it was a loving thing, along the lines of honey or sweetheart but in English it sounded...well, odd. Imagine if instead that student had gotten hold of a Polish to English dictionary. What would she have thought? That was just two words. Now imagine your entire life – or your entire WIP – translated into Japanese. Not only are our languages very different but also our cultures. Could a Japanese translator understand your characters’ motivation, their emotions, even their funny little quirks. Could a translator transform a shy, lovesick teenager who goes ATVing into a depressed loner with a death wish? The Translator: A Novel begins with a misunderstanding in a Japanese-to-English book translation. The translator, Hanne Schubert, falls down a flight of stairs and suffers an unusual condition―the loss of her native language. Speaking only Japanese, she tries to fix the translation by reaching out to the author’s inspiration a tortured, chimerical actor, once a master in the art of Noh Theater. Along the way she realizes that not only words can be mistranslated. Sometimes entire relationships, entire lives can be mistranslated. This book is available as a print book, e-book and audiobook at Amazon, Barnes & Noble, and IndieBound. To win a copy of The Translator: A Novel, please enter using the Rafflecopter form at the bottom of this post. The giveaway contest closes this Friday, September 18 at 12:00 AM EST. We will announce the winner the same day in the Rafflecopter widget. Good luck! Nina Schuyler's first novel, The Painting, (Algonquin Books of Chapel Hill, 2004), was a finalist for the Northern California Book Awards. It was also selected by the San Francisco Chronicle as one of the Best Books of 2004, and dubbed a “fearless debut” by MSNBC and a “great debut” by the Rocky M ountain News. It’s been translated into Chinese, Portuguese, and Serbian. Her short story, “The Bob Society,” was nominated for a Pushcart Prize. Her poems, short stories and essays have appeared in ZYZZYVA, Santa Clara Review, Fugue, The Meadowland Review, The Battered Suitcase, and other literary journals. She reviews fiction for The Rumpus and The Children’s Book Review. She’s fiction editor at Able Muse. She attended Stanford University for her undergraduate degree, earned a law degree at Hastings College of the Law and an MFA in fiction with an emphasis on poetry at San Francisco State University. She currently teaches creative writing at the University of San Francisco. WOW: As writers we're always seeking to create characters that "jump off the page"―something you have achieved with The Translator. What comes first in your writing, a character or a plot? NINA: Thank you so much for your kind words! For The Translator, the idea came before the characters or the plot. I read an article in The New Yorker, "The Translation Wars," by David Remnick about a married couple busy re-translating all the great Russian novels into English. They'd originally been translated by a 19th century English woman, Constance Garnett, and she'd done a poor job of it. As a girl, I devoured Russian literature, and, it turned out, I'd read the Garnett translations. I became fascinated with translation and ended up reading a lot of books about the theory of translation. When you read a translated book, whose story are you getting? What is the process of translation? Where does subjectivity come into the picture? Let me say, when you start with an idea, it takes a long time, or it took me a long time, to develop Hanne, my main character. I interviewed translators to understand how they work. When I heard one translator say that she only took on a translation project if she understood and could relate to the main character, I heard the rumblings of trouble, and trouble means conflict. What if she thought she understood a character, but didn’t? What if her life experiences clouded her understanding somehow? WOW: Many writers construct background stories for their characters even down to things like what they eat for breakfast. Have you done that with any of your characters? NINA: I haven't. I think I write to discover. I really enjoy being surprised and to do that, you have to be comfortable sitting in the unknown for long stretches of time. It's on revision that I step back and think about a character more deeply, asking, how can I complicate motivation? How can I create more contradictions? These questions invariably lead me to write richer, more dynamic characters. So with Hanne, she is very precise and controlling about her work. Yet in her personal life, she has relinquished all control over her daughter, who hasn't spoken to Hanne in six years. Hanne appears to see all and have the language to describe and interpret, and yet, she has major blind spots, unable to see her faults and missteps. WOW: Are your characters based in any way (physical characteristics, quirks, life stories) on your friends and family? Or perhaps on yourself? NINA: There is always a blurry line between fact and fiction, between the external world and the imaginative. As a writer, at the very least, you draw upon your inner world and emotional landscape to gain understanding about a character. What does it feel like to be lonely? Isolated? To triumph? I always have a notebook with me, writing down bits of dialogue, images, gestures. I understood perfectly Hanne's obsession with language. In her mind, she is constantly constructing the world through language. Yes, I do that. I'll walk by someone and start searching for descriptive words. Now that I think about it, I guess that's pretty quirky. WOW: What do you feel is the biggest mistake writers make when seeking to make their characters "come alive"? What is the lesson you hope students learn in your classes on creating characters? NINA: The usual mistake stems from what I believe is an act of generosity. Writers, worried that readers might not understand something, put too much on the page. I'm guilty of that, too, in my early drafts. Telling too much; making the motivations of a character too neat, too clean, a straight line between the past and the present action; avoiding a character's complexities and contradictions. But if all the clues are evident at the start, the reader cannot imaginatively engage. And that's what makes a character come alive--the reader's engagement with them. WOW: Do you have any suggestions of books or authors where we can meet characters that are truly realistic and memorable? NINA: Oh, there are so many. I'll list some of the books that I've recently read: Euphoria by Lily King, Netherland by Joseph O'Neill, any short story collection by Alice Munro, Olive Kitteridge by Elizabeth Strout, anything by Grace Paley, My Brilliant Friend by Elena Ferrente. I'd be interested in hearing from your audience--where have you met lifelike characters? WOW: I'd love to hear from our readers on that too! Can we have a sneak peek at what you're working on now? NINA: I'm not sure what's unfolding. Something to do with the blend of history and contemporary, and how family secrets bleed into and distort the present moment. Whatever it is, I'm engaged! WOW: And I’m sure we will be too when we get to read it! Stop by for an interview with Nina Schuyler and a chance to win The Translator: A Novel! 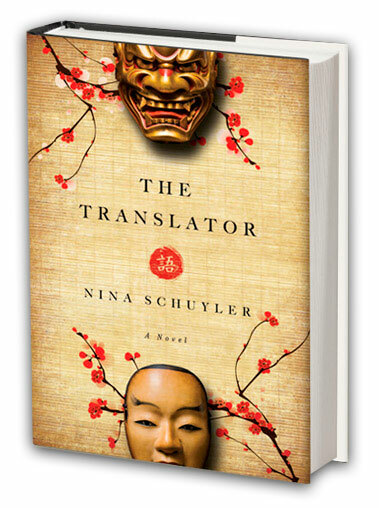 Learn more about author Nina Schuyler and enter to win her latest novel The Translator. Learn more about author Nina Schuyler in today's interview and don't miss TWO chances to win her novel The Translator. Enter to win a copy of The Translator by Nina Schuyler and learn the importance of creating complex female characters. Read a guest post by author Nina Schuyler and enter to win her novel about love, family and understanding yourself --The Translator. Enter to win The Translator and an extra surprise – they’ll both help you escape to another country. Looking for a great new read? Read today's review of The Translator. Learn how to weave memories into a storyline from Nina Schuyler, award winning author of The Translato. Want to curl up with a good book? Don't miss this review of The Translator by Nina Schuyler. Don't miss this review of The Translator and a chance to win a copy! Jodi shares five reasons she’s glad she read The Translator. Konnichiwa! Read a review of The Translator: A Novel by Nina Schuyler and read a post about learning a foreign language in later life. Nina Schuyler, author of The Translator: A Novel, shares five things that might make you fall in love with Japan. Don't miss a review of The Translator: A Novel by award winning author Nina Schuyler. Today you have two chances to win The Translator: A Novel and read an interview with the author Nina Schuyler. Enter to win a copy of The Translator: A Novel! Just fill out the Rafflecopter form below. We will announce the winner in the Rafflecopter widget this Friday, September 18. Thank you for your thoughtful words. Yes, good luck! I hope you win a copy, too! Best of luck, Nina! Sounds like a great read. Thank you so much! I hope you enjoy it. Did the plot line change much from your first thoughts for this book to the moment it was completed? I am looking forward to reading The Translator. So different from what I usually read. Thank you! What do you usually read? I knew that there would be a literal translation and Hanne would make a mistake. I also knew there would be a metaphorical translation, but I wasn't sure how it would go. What do I mean by that? The book explores translation as a metaphor, how, in fact, we are translating all the time. Every action, every word, we are busy interpreting, and sometimes we get it wrong. It took many drafts to have the two translations--the literal and the metaphorical--talk to each other, so that one plot line naturally led to the other. You'll have to let me know if I succeeded at that, though. By the way, that picture alongside one of my comments--that's my husband.